"It all seems so straightforward. Except for one thing..."
Hercule Poirot stepped from the train platform and surveyed his surroundings, his keen eye seeking a familiar face amongst the travelers, well-wishers and servants engaged in business various and sundry. "Poirot, old chap! So good of you to come!" A man with a megaphone and a rider's crop emerged from the shadows adjoining the ticket booth and greeted the Belgian detective with a hearty handshake. Poirot arched an eyebrow and nodded in acknowledgment. "We're all waiting for you back at the set. I've got a car." Poirot found himself hastened to a waiting vehicle by a pair of burly Production Assistants, nearly losing his familiar straw hat in the process. The Rolls Royce pulled away from the station and accelerated rapidly, the desert landscape blurring into horizontal bands of brown and blue. The director shouted into the artificial wind, raising his voice for Poirot's benefit. "I'm glad you could come out here on such short notice. Everything's been going so well, but we seem to have a dead production on our hands." Grimacing at the effort necessary to respond, Poirot leaned forward. "This production of which you speak, it is a motion picture of some variety?" "Indeed, sir. A television adaptation of your 1936 adventure, which we're calling Poirot: Murder In Mesopotamia." "Ah, yes. A very unusual case." "Well... no, in truth. Not strange at all. Rather like many of my other adventures." "That may be our problem. We've called in the experts for the post-mortem." The director's well-appointed automobile arrived at an isolated enclave of mud-brick buildings, whose open windows provided ventilation in the oppressive heat. The director escorted Poirot into a structure close by, where a gathering of some size had assembled. The room fell silent as Poirot entered, and the director stepped aside, ceding the floor to the Belgian criminologist. Poirot stood in place, his compact, stocky frame an imposing presence in spite of itself, while his eyes adjusted to the relative darkness. In the center of the room were reels of film, period costumes and props, organized and neatly labeled. A group of whispering actors stood nervously to one side. Poirot waited. The whispering ceased. The production crew exchanged worried glances amongst themselves, but no one spoke. "From the perspective of the... outsider, all seems well, no? The costuming is accurate, the period flavor exquisitely rendered." The production designer smiled wanly. "Given the limited financial means provided." The production designer nodded vigorously, as the producer's face fell in shame. Poirot turned his attention to the cast, huddled together as if in mortal fear. "The casting seems appropriate. I recognize hints of my erstwhile Mesopotamian acquaintances in each of your faces. And M'sieur Suchet, you could be my long-lost twin brother." The actors, shocked by the unexpected commendation, separated and straightened, preening discreetly as each pondered which of his or her several qualities Poirot might have found most appealing. Only David Suchet stood apart from the group, his focused, scholarly preparation having prepared him even for this unexpected meeting with his longtime subject. Poirot smiled briefly at the actor, then turned to his host, whom he now recognized as one Tom Clegg, a director of some reputation in the television industry. "The direction is competent. I see no crime of framing or editing, no cinematic malfeasance of any sort. Again, given the financial constraints." "None of these dedicated souls are to blame. They had no motive, none. I regret to inform all of you that the murderer is..."
The room froze in anticipation of the next accented syllable, which at last emerged from beneath the detective's waxed moustache. Everyone gasped in shock and horror. Poirot savored the moment of revelation briefly, then continued. "The clich�s and red herrings, the unlikely circumstances which conspire to reveal the murderer. The two-dimensional characters whose reactions are so predictable as to facilitate myriad false leads and a single solution. All of these are indicative of the classic Christie modus operandi." Here the screenwriter, Clive Exton, threw himself on the sand-strewn dirt floor in anguish. "Monsieur Poirot, I tried to stop her! I tried to inject credibility and life into a hoary old detective trope. I really did!" "Hush, Mr. Exton. It is not your fault. Nor is it, in a sense, the fault of the source material. No." A hushed but active hubbub engulfed the room as Poirot continued. "The fans are to blame. The fans who encouraged Madame Christie to write the same story over and over. Who bought it, and bought it, and bought it again. These are puzzles, not stories. Not literature. They are tres dificil to adapt to film because they are essentially mechanical, inhuman." A wave of relieved surprise swept over the room. Poirot tipped his hat, smiled knowingly, and began making his way to the exit. Without warning, innumerable black-robed, hooded figures invaded the building's windows and knocked its wooden door aside. They surrounded Poirot efficiently and silently, their glinting, serpentine daggers raised for the attack. The daggers fell, a cacophony of clashing metal and tearing flesh filling the air. The Agatha Christie Fan Club was exacting its premeditated, highly ritualized revenge upon this infidel who would dare to desecrate Her name. A confused young man in a Star Trek T-shirt wandered in, nudging the director's arm as the bloody carnage continued. "So, was that guy, like, French, or what?" Miss Marple stepped from the train platform and surveyed her surroundings, her keen eye seeking a familiar face amongst the travelers, well-wishers and servants engaged in business various and sundry. Image Transfer Review: A&E presents Poirot: Murder In Mesopotamia in its original made-for-television full-frame 1.33:1 aspect ratio (framing occasionally seems cramped, but not cropped). The transfer has a "video-originated" look, with significant edge enhancement and some smeariness in complex areas of the image. Detail is otherwise good, and the program's muted colors seem to be captured accurately, though flesh tones look a bit orange to my eye. Not a bad transfer, not a great transfer�just what's expected from a recent cable production. Audio Transfer Review: The program retains its broadcast stereo sound mix, presented in Dolby Digital 2.0 format on DVD. Dialogue and sound effects are strictly center-oriented, with music in stereo, and dynamic range is compressed, per television tradition. Dialogue, often recorded live, is clean and well-captured. A competent audio presentation, but nothing to get excited about. Extras Review: A&E supplements the feature attraction with 11 picture-menu chapter stops and a handful of Poirot-related extras. Well-written biographies cover author Agatha Christie, actor David Suchet, and the fictional detective Hercule Poirot. Suchet's biography incorporates a selected filmography, and the coverage of Poirot includes a complete list of Christie's stories about the stout Belgian detective. A&E also includes a promotional TV spot, though it's not advertised in the keepcase copy and simply plays immediately before the movie itself. 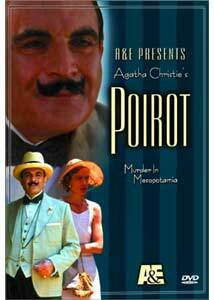 Poirot: Murder In Mesopotamia is a banal but faithful Agatha Christie adaptation, sure to please fans of the genre. A&E's DVD features a competent transfer, though supplements are limited. For mystery fans only.